Learn how to play the Guitar or the Cello with Sasha and Natarani. Tuition is available to all ages. Private and group tuition is available. Classes are available at our studio in Titirangi or at the convenience of your own home (Auckland area). Natarani enjoys teaching beginners to advanced students of all ages. She teaches using the Suzuki method, which emphasizes developing an “ear” for making music. Natarani has a Master of Music degree from Canterbury University (1998), with Alexander Ivashkin. She also has a Postgraduate Certificate from Trinity College of Music London, majoring in cello. She is a certified teacher of the Suzuki method and her performance experience includes the Auckland and Christchurch Philharmonia and the Christchurch Symphony orchestra ( 1995-2000). She currently plays in the Waitakere orchestra and Bach Musica. Apart from her role in Heartstrings Duo, Natarani continues to accept roles as a professional cellist with orchestras, chamber ensembles & recitals. Sasha offers friendly positive instruction, building technical confidence in both young and adult students. As a teaching aid in sight reading, Sasha uses a unique colour coded system he has developed. Sasha is establishing a flourishing Suzuki guitar studio. 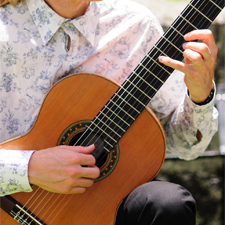 Sasha has a Diploma of Music Auckland and Christchurch University 1995, has completed postgraduate studies with well-known guitarist Miles Jackson from Nelson and continued his studies with classical guitar masters in Canada and Venezuela. He has seven years experience as a professional musician in the Auckland and Christchurch region.